Standard UTP network cable used either to connect a computer to a hub/switch or to link two hubs or switches together via the uplink port. The CAT5e standard is specially designed to support very high-speed 1000 Mbit/s Ethernet. 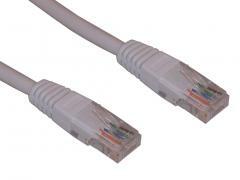 The cable also supports ordinary 10/100 Mbit/s Ethernet.